The last few weeks Owen has been really interested in animals, what they eat and what eats them. So that started our "hunt". 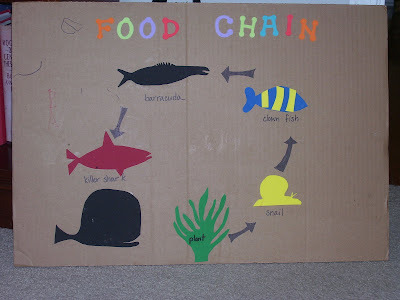 The first food chain we created was from his memory of "Finding Nemo." IT amazes me as to what they learn from observation of a movie 3 years ago. We got out the movie and watched parts of it again to make sure we had our facts straight. (Besides the whale eating the shark..I think we are on target) . Today he wanted to check out other habitiats and different chains within those biomes. He decided on his own creation. Rodent eats plants, fox eats rodent, and cougar eats fox. We learned that most chains aren't longer than 4-5 cycles (animals). Is this the beginning of homeschool? I don't know, but I do know we didn't even realize the learning. It was natural, comfortable, and fun to meet Owen where he is interested. Just a glimpse of our afternoons! 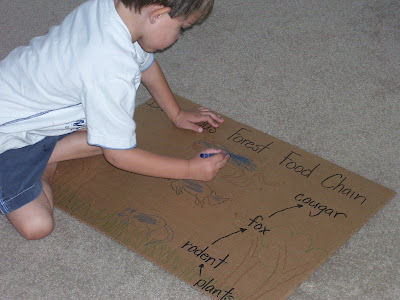 What a sweet glimpse into a natural learning experience. You have experienced the heart of homeschooling. Follow his lead. It is amazing the possibilities. 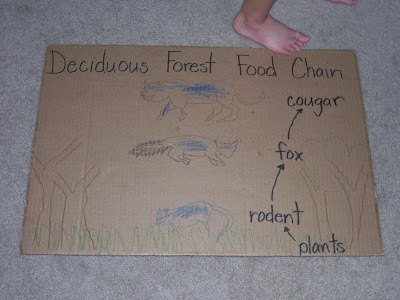 those were great food chains. that is precious!! you are a great momma. thanks for letting me observe. love you.